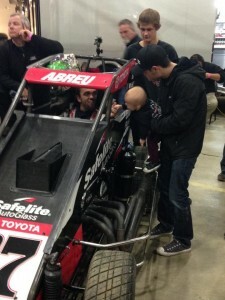 Rico Abreu strong win night 2 Chili Bowl | Talking Speedway, Speedway news from around the world! Night 2 at the Chili Bowl and Rico Abreu telegraphs his Championship intentions with a powerful win in the night 2 Feature .Rico’s form when he is behind the Wheel of the Kunz Toyota is alway at such a dominating standard tonight was no different. young Oaklahoma flyer Tyler Thomas sat on the pole and raced into the early lead .Tyler has been fast all night and for the first 11 laps managed keep Abreu at bay .Abreu was aggressive on the restart after the caution and stole the point from Thomas .As hard as Thomas tried and with the assistance of late race cautions could still not managed the pass to retain his race lead . The difference between the pair , experience and Thomas will be a stronger challenger in the Championship decider .The big mover on the night picking up a load of passing points was Parker-Price Miller. 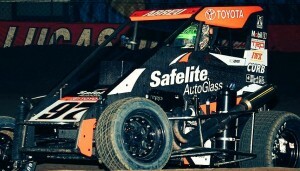 This entry was posted in Chili Bowl, General Speedway News, The US Report, USAC Midgets by admin. Bookmark the permalink.